As if mowing your lawn weren't a chore already, lawn mowers are notoriously difficult to start. The type of lawn mower that you push has a rip chord that you have to furiously pull back to get the motor started. It's so difficult to do that there is a weightlifting exercise affectionately named the "lawn mower." True to form, the lawn mower exercise is exceptionally difficult. It's a back muscle exercise, and you can perform it using a dumbbell or a cable machine. The exercise that it's most similar to is a dumbbell row, but there is a difference — the lawn mower is more of a full-body exercise. The point of the lawn mower exercise is to use more weight than you normally would with a dumbbell row. Just like pulling a rip cord on a lawn mower, you're supposed to yank the weight up with all of your might. As you pull the weight up, you can push into the ground with your legs and turn your shoulders, using momentum to get the weight up to your shoulder. In a traditional dumbbell row, you're not supposed to use momentum to pull the weight up. Instead, you're supposed to isolate the back muscles by moving the shoulder and arm only. Using more of your body in the lawn mower exercise allows you to use more weight, but you sacrifice some of the isolation benefits of a traditional row. This makes the lawn mower more of a strength exercise than an isolation exercise. Even though you use your legs to get more power, you still use back and arm muscles to pull the weight up. The back muscles that you use are your latissimus dorsi, the biggest muscle in your back, as well as the rhomboid major and minor, teres major, rear deltoid and trapezius. With the exception of the latissimus dorsi, which spans from your lower back all the way up and out to your shoulder, all of the back muscles are located that you use in a lawnmower row are in the upper back, around your shoulder blades. Rows also use your bicep, which is the muscle in the front of your arm. Lawn mowers can be a dangerous exercise for someone with a back injury. Due to the aggressive nature of the exercise, it's usually performed with heavy weights, which increases stress on the back. When you do the exercise you're supposed to rotate your spine, which can exacerbate an existing back injury. 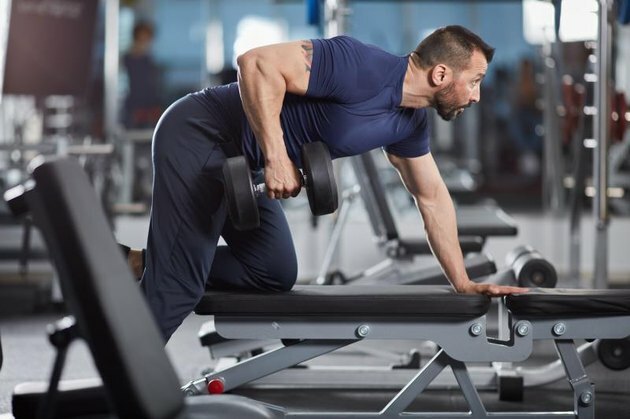 If your back is injured, stick to traditional dumbbell rows. This is the traditional version of the lawn mower exercise. How to: Place a dumbbell on the ground. Get into a lunge stance next to the weight with your right foot forward and left foot back. Lean your right elbow on your right leg. Pick the dumbbell up with your left hand and pull it up to your shoulder, then lower it back to the ground. Using a cable machine for this exercise changes the angle at which the weight is pulling. How To: Put a cable on the lowest height setting. Get into a lunge stance with your right foot forward and left back. Grab the handle with your left hand. Pull back and touch your left hand to your left chest, then lower it back down.